With the likes of Paul Lee of UE, Erick Salamat of Ateneo, Chris Camus of UST, and RR Garcia of FEU in the running to get the National Collegiate Player of The Year Award this 2011 a very surprising player who came all the way from Cebu snatched the most coveted award. He is known as Junmar Fajardo. He is the 6'10 center of the University of Cebu Webmasters. This very prestigious award was last won by Ateneo's Nonoy Baclao who became the number 1 draft pick of Air 21 last year. 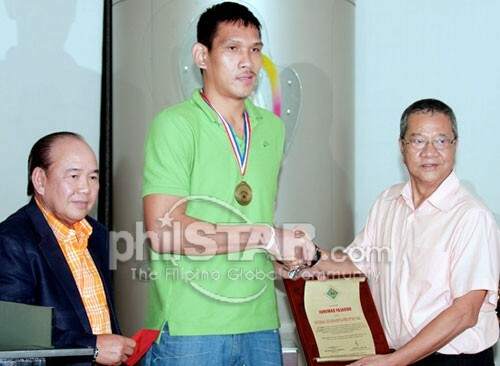 Junmar wins the award and he is on his way to becoming a number 1 draft pick of the PBA. Junmar led his UC Webmasters team to a Final 4 slot in the last Philippine Collegiate Champions League. The PCCL is the counterpart of the US NCAA Division 1's Sweet 16. The league's chairperson, Reynaldo Gamboa and the head director, the legendary Mr. Joe Lipa saw the greatness of Junmar Fajardo. They decided to give him the said award despite their lost to the eventual champions Ateneo De Manila Blue Eagles in the Final 4. Junmar received a plaque of recognition and a cash prize in front of a huge crowd at the ABS-CBN Compound in Mother Ignacia Street in Quezon City. This marks the end of a long dominance of the UAAP players and NCAA players in winning the prestigious award. I am sure that Junmar will forever remember that moment. Wherever he goes, whether he plays for Smart Gilas in the near future of when he's in the PBA unleashing his dominance, he will forever remember this momentous event in his career. Hello. The problem lies on the part of Junmar's manager.. He doesn't want him to play for Gilas..
give this kid a chance to play for a developmental team, he has a lot of skills to develop, this kid is a potential player. he can be a dominant player like taulava.